Malcolm Speed has revealed that his ‘vigorous’ opposition to the ICC’s inaction over Zimbabwe was the main factor in his sacking. With the situation in Zimbabwe showing little sign of improvement, the links between Zimbabwe Cricket and the ruling Zanu-PF party are more and more embarrassing for the ICC, and the lack of action is one of the biggest missed opportunities for cricket in the last few years. There’s more from Malcolm Speed here. The First ODI between Sri Lanka and Zimbabwe was a little one-sided. The Second was a hammering, with the tourists winning by 9 wickets with 194 balls remaining. There was little in these first two matches, then, that suggested the Third ODI would be a close run thing. Nevertheless, Sri Lanka scraped home by a mere 5 runs. Only the combined might of Muralitharan, Mendis and Thushara finally slowed the home side down, tipping the balance in an incredible 28-over thriller. Whilst the political situation in Zimbabwe hasn’t improved at the rate I had hoped (and may even be getting worse), it seems the nation’s cricketers are still capable of giving a side like Sri Lanka a decent game. Despite the recent political turmoil and the ongoing social crisis, not to mention the fact that its cricketing infrastructure is non-existent, Zimbabwe has been allowed to remain as a full member of the ICC. This decision (or rather, non-decision) continues the ICC’s long tradition of burying its collective head in the sand where Zimbabwe is concerned. There has been much debate within cricketing circles on the efficacy of sporting boycotts, but I find it interesting that the two strongest proponents of a ban have been England and South Africa. Both countries, lest we forget, have some experience in such things. In any case, why wasn’t this the first point on the ICC‘s agenda? Is it because more time was needed to try to persuade Pakistan or Sri Lanka to support the ban, or because the needless reclassification of a dead-rubber from two years ago was considered to be more important? The exclusion of Zimbabwe from the World Twenty20 is a fudge, and offers the ECB an opportunity to keep hold of a potential cash cow without provoking the rage of Gordon Brown (assuming he’s still in power by then). When it came down to it, it seems that the ICC has (not for the first time) let money talk, whilst avoiding the real issue. Following Cricket South Africa’s suspension of bilateral agreements with Zimbabwe yesterday, the ECB (in response to government pressure, with the matter even being discussed in today’s Prime Minister’s Questions) has followed suit, which has increased the pressure on the ICC to take strong action when they meet to discuss the issue next week. Hopefully, the crisis will soon be resolved for the long term good of the country. 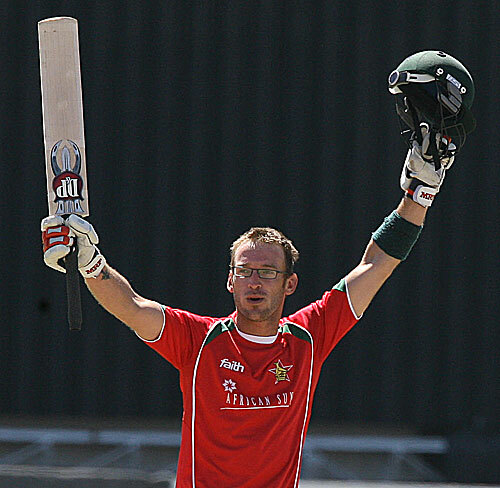 I know that some people reading this will be sick of me writing about things other than those directly relating to cricket, and I’ll be glad when I can write about Zimbabwean cricket without immediately calling to mind stories like this. Following the recent political developments in Zimbabwe, it has been made painfully clear that the cricketing authorities would have to take some sort of action. Today, Cricket South Africa (possibly reacting to player unrest and media pressure) severed its bilateral agreements with the Zimbabwean cricketing authorities. This, along with the general tone of recent developments, will, with any luck, force the ICC to do something. I’m hopeful that cricket will do what it can to bring about the necessary change in Zimbabwe, and I’m relieved that the previous attitude of those in charge has seemingly ben replaced by a more positive approach. A role for cricket in changing Zimbabwe? Anyone who’s been watching the news recently will know all about what’s been happening in Zimbabwe (except, of course, for those who live in Zimbabwe). The rapidly deteriorating situation in the country will have many effects, but one of the (admittedly less important, given the many other problems) repercussions of recent developments will be that those in the ICC who have previously argued that politics and sport shouldn’t mix may now have to face facts and withdraw support for the Zimbabwean cricketing authorities. Cricket may even have a small part to play in the development of a more stable future for Zimbabwe. Sporting boycotts and semi-political pressure have a history in the region, of course. Whilst the circumstances of the South African boycott cannot be directly compared to what’s happening at the moment, even the players realise that some things are more important to the so-called ‘Spirit of Cricket‘ than million-dollar matches. I’m not pretending to be an expert on the situation, but it’s clear to me that anyone involved in cricket should be using whatever authority they have to help, rather than hoping the problem will go away.